Throughout the years, I have come across a growing number of people on the cusp of burnout in communities and organizations across the spectrum of the gospel-centered discipleship movement. Many were close friends, few were acquaintances, and one of them was me. Tired, worn-out souls exhausted from making disciples in community and on mission. They are faithful people—well-trained, well-supported, and well-resourced. What’s worse, this fatigue often ends our desire to make disciples and kills our capacity even to try. Why are we so tired? We are looking for fruit. We desire fruitful lives. In my own journey, as the months and years continued to pass by without a rapid multiplication of communities with baptisms and new churches formed, I grew exhausted and discouraged. We must be doing something wrong or must not be working hard enough! Eventually I simply thought I had wasted years of my life. I was fruitless. 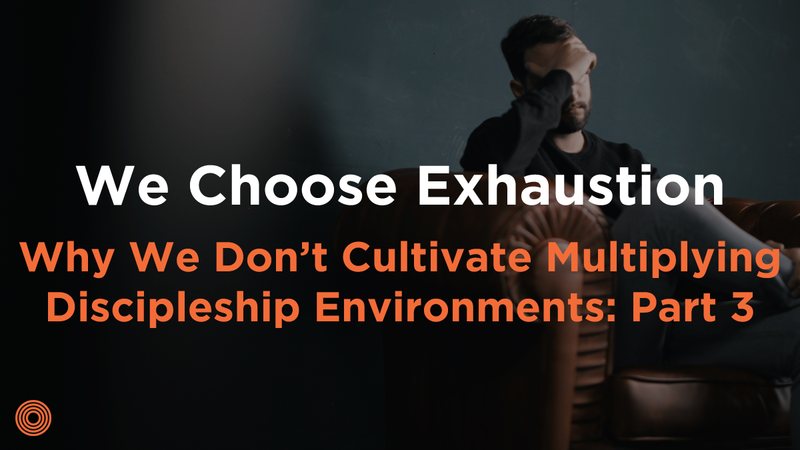 Many of the people I talk to experiencing discipleship exhaustion have the same experience. Interestingly, the fruit that is expected from us in the Scriptures, not in our heads, is not new churches, converts, or communities. Rather, God wants to produce love, joy, peace, patience, kindness, goodness, gentleness, and self-control in us (Gal 5:22–25). On the other side, this is what the Spirit does through us: performs miracles, brings people to repentance and faith, produces new life, gives gifts, baptizes, and appoints elders, among other things. Leaders experience exhaustion when we measure the wrong things. When you strive to produce things the Spirit is in charge of, you work harder than you ought and place responsibility on yourself that you could never carry. This is a sure recipe for fatigue. When we pause and reflect on the fruit of the Spirit born in us, we are encouraged because we see things the way they are. When I stopped to see the things the Spirit had done in me, I realized my life wasn’t fruitless. In fact, it had been very fruitful. Over the years God had given me love for people I didn’t even know at the beginning. God had given me peace in my heart and marriage. God had created, seemingly out of nothing, a contentment with small budgets and His presence. The reality was God had been working in me. Ironically it was that fruit in me that God used to produce fruit in others. Leaders who are striving for success and “great stories” expect them to happen immediately. This is one of the oldest tricks the enemy uses to destroy mission: get them to think they can make a name for themselves. The urgency to have a thriving missional community or life that produces results that are celebrated is exhausting. It is tiring trying to be an expert and gain the affections of “missional” peers. Self-serving mission leads to burnout 100% of the time. If the urgency of ego isn’t for self-gain, it is for another’s. I have also witnessed people crushed by the burden of proving themselves to their leaders’ apparent expectations, which in many cases didn’t exist. This is a slightly different urgency. This is where the goal is to do exactly what we read in the “book” or saw at the conference. We expect and strive to do things by the book. The books are helpful and so are the conference speakers. What becomes exhausting is a newfound legalism: modelism. When you have a problem or get stuck, you are turning to the experts’ blog, book, Twitter feed, and videos. These can be helpful, no doubt, but in the end, the mission is too difficult to look for strength and endurance in a model that can’t offer either. To be clear, I am all for intentionality, and I completely agree that God is using us and can use us all the time. However, I would add God also wants to do something in us at all times. Gospel intentionality, the opposite of agenda-driven intentionality, asks regularly, “What is God doing in this person’s life? Where is His grace apparent? What is is God saying?” Or better yet: “What can I do to see Him clearly in all of life—my life?” The gospel means we are reconciled with Christ. Our redemption is to life with Him. Our commissioning is with Him. We often forget this in our rush to live intentional and missional lives. We have been called to make disciples of Jesus in all of life by being a disciple of Jesus in every part of life. Discipleship is inviting people to experience the reconciliation and redemption of Jesus in their lives, too. In this way, be a normal person who experiences the supernatural presence of Jesus through the power of the Holy Spirit. We often expect to see fully-formed disciples after a few months or even a few years. When we don’t, we throw our hands up and say, “This doesn’t work. What else can I try?” Imagine you move into a street where your house is the only one who believes Jesus is King and Savior of the world, and even you struggle to believe it in almost every area of life. However, you buckle down and go for it. After a few years, you have made great relationships with neighbors and have spoken the gospel in several ways and at several moments. You have wrestled with some of your idols, too. Your marriage went through a very difficult time, but you are starting to see restoration. You praise God for all your new friends, opportunities, and growth, but you feel that you have failed. You haven’t baptized anyone. You should stop what you are doing. If you attempt to do more than you are called or asked of by Jesus, you will be tired. There is a simple equation found in the book Margin by Richard Swenson: Your Load (or what you are called to do) – Your Power = Margin. Your load is what you are called to do, what is being asked of you, what you have taken on as your responsibility. Your power is your capacity, gifts, time, strength, and finance at your disposal to do it. Margin is either sanity or chaos, under- or over-utilization. It is a simple equation; if you are committed beyond your power, you will be exhausted. If you do far less than you have power to do, you will be bored. Too often, we assume the role of saving the planet or, if we are modest, our community. We accept great and worthwhile roles and responsibilities followed by a belief that we are omnipresent, omniscient, and omnipotent. If you don’t believe you are those things, you have believed the laws of time, finances, and energy don’t apply to you. You press on with a packed schedule and slim bank account. The Spirit is powerful and works in remarkable ways. The Spirit does not call you to more than He will supply the power. Jesus calls us to more than we can do on our own, but He doesn’t call us to more than He will empower. Finally, we are tired when we are mission-centered. The noblest idol in all of Christianity is mission. We approve when people worship it, celebrate it, and lay their life down for it. The idol of converts is as powerful as it is subtle. It is easy to drift. Here lies the problem: Mission doesn’t give power, energy, grace, or redemption. Reconciliation of the gospel makes us ambassadors for the Reconciler, not mini-reconcilers. This is the end result of all the things mentioned above. We have drifted from gospel-centered life to a mission-centered life. We make disciples of the mission instead of disciples of Jesus. The mission isn’t a good savior, and our exhaustion persists. We persevere in our exhaustion because we like it. We believe it makes us more appealing to God. Surely Christ will see the bags under our eyes and say, “I’m pleased with you good and faithful servant.” We believe it makes us more privileged in churches. Surely others are looking at our schedules, saying, “There goes someone who really goes after it!” Unfortunately, the dramatic circus of motion in our lives doesn’t cultivate a discipleship movement. We don’t have space or energy to walk closely with God or with others. 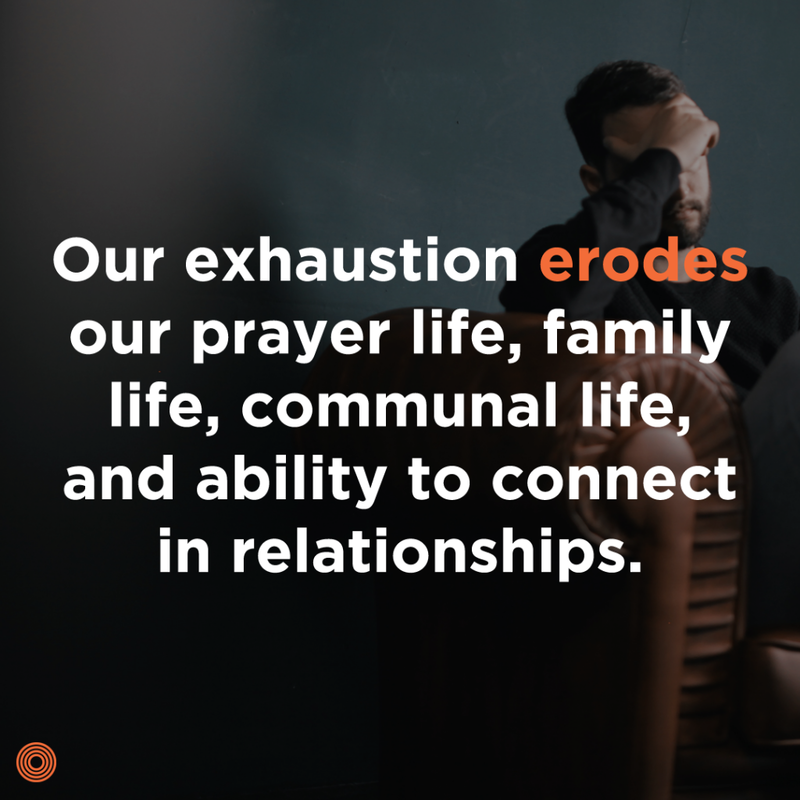 Our exhaustion erodes our prayer life, family life, communal life, and ability to connect in relationships. Sadly, it makes everyone we’re leading nearly as tired, too. We’ve discipled them to believe they must be tired and constantly active to be a disciple. The ripple effects of a fatigue-driven culture are devastating. Q: Do we believe Jesus is more satisfying than our exhaustion? Q: What makes you tired? How do you choose that fatigue? Q: What would it look like to come to Jesus and be satisfied in him? Do you see the early signs of burnout and trying to produce fruit yourself instead of letting God produce fruit?